Hi! My name is Alyssa and I am the one behind the camera at Mae Photo Co. 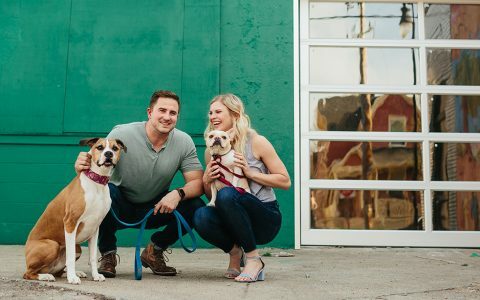 I live in the wonderful city of Grand Rapids with my husband Andrew and our two dogs: Fern and Zayda (our little family is pictured above). I admire my family, marriage, real relationships, indoor plants, laughter, the comfort of home, and creating beautiful art through photographs. I absolutely love living in the city but a long term dream of mine would be to live in the country and have a small lavender farm (to photograph in of course) and a vegetable garden. My love for photography started way back in high school yearbook and continued on where I received my Bachelor of Science degree in Photojournalism at Cornerstone University. I firmly believe that part of my calling on Earth is to create timeless photographs of real moments for people to enjoy. My favorite parts about being a photographer are the people I meet along the way and how uniquely different everyone loves. Now lets chat, I would love to meet you and I would be honored to document this stage in your life!